Boss Dean Austin has admitted Brendan Moloney’s departure from Sixfields is part of ‘the fallout’ of the Cobblers’ relegation to Sky Bet League Two. The Irish defender announced this week that he has rejected the offer of a new contract at Town, and will move on when his current deal expires on June 30. The 29-year-old leaves after an impressive three-and-a-half-year spell at Sixfields that saw him make 108 starts and seven substitute appearances for Town, scoring two goals. 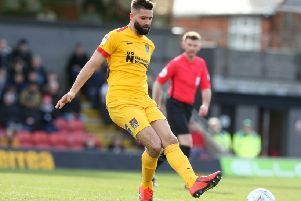 Part of the 2016 league two title-winning squad, Moloney is understood to have agreed terms with a club in Sky Bet League One, and Austin admitted it was an offer that the Cobblers simply couldn’t afford to match. “Brendan has been a great servant to the club, he is a good player, and a great person,” said the Cobblers boss. “But then you have a situation where someone has an offer from a league one club and you know where you are. “There is always a fallout from dropping out of a division, and we have got that little bit of fallout now, and we have to balance our books accordingly. And he added: “I went to see Brendan and we had a good chat. “He explained to me he had been made this very good offer by another club, so we shook hands and agreed to part on very good terms. “He has enjoyed his time here and has done very well for this club and he will always be welcome back here. Moloney’s departure, allied with Aaron Phillips not yet deciding if he wants to take up the contract offer the club made to him at the end of last season, means Shay Facey is the only specialised right-back in the Town squad. And that is not something Austin wants as he tries to shape a squad capable of winning promotion from league two next season. “Shay has real potential, but you really like to get to the stage where you have two players for every position come August, and then the boys can battle it out,” said Austin. “I don’t want players too comfortable, I want players hungry and I want players that want to fight for this great football club. Austin is still waiting to discover whether or not Phillips will be at the club for the new campaign. The former Coventry City full-back hasn’t played since suffering a thigh injury last August, meaning Austin has yet to even see him play as he has only been at the club since September. The Town boss has offered Phillips the chance to regain full fitness at Sixfields and a new deal, but says the decision on the player’s future rests with Phillips himself. “I have left that one with (head of recruitment) Andy Melville,” admitted Austin. “I had a conversation with Aaron, and again he is a really, really good person, and I said to him that it was a difficult one for us, and for him. “That’s because he hasn’t played, and I haven’t seen him play and this, that and the other.